Greece has always been one of my favourite destinations. The heady scent of the wild mountain herbs, windy warmth, clear blue seas where the fish swim around your legs and the slower pace of life is a recipe for recharging the batteries and renewing the senses. The perfect atmosphere to reflect on life and to reassess priorities. It is always great to spend time with family, but relaxing in the warmth of the Mediterranean and particularly slowing down the pace, enables greater patience and a better perspective on what is important in life. The Greeks really value their children and families and somehow always keep them central, which is a great leveller. Travelling gluten free is still relatively new to us and we are still establishing our confidence. 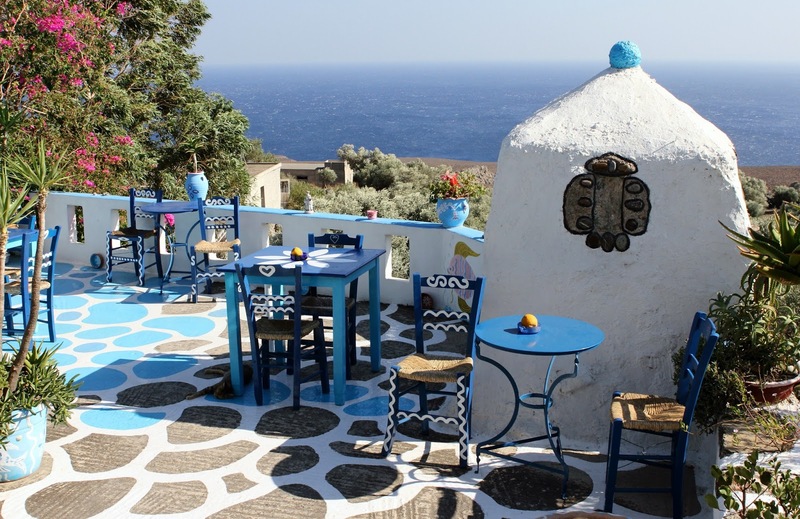 Research told me that Greece does not have supermarkets stocked with special gluten free products and is one of the destinations in Europe with a very limited understanding of Coeliac Disease and the needs of its sufferers. Making sure I was fully prepared, I packed a suitcase full of gluten free long-life rolls, crackers, pasta and biscuits 'just in case'. I armed myself with a Greek gluten free restaurant card (which explains in Greek what Coeliac means and the requirements of food preparation) and off we went. As it happens, we brought back the pasta, some of the rolls and crackers and stuffed our faces with the biscuits on the aeroplane just to get rid of them on the return journey................... The Greek restaurant card helped enormously (you can get them in many languages from the Celiac Travel website), and we lived on fish, grilled meats, vegetables, stews and salads. Most of the restaurants were genuinely interested and concerned to make sure they understood our dietary requirements and those that did not inspire confidence, did not get our business. And so we survived........................ all well. Job done! Having had lots of fish in Crete (my daughter particularly enjoyed swordfish), I returned with a nostalgic hankering to continue eating it. 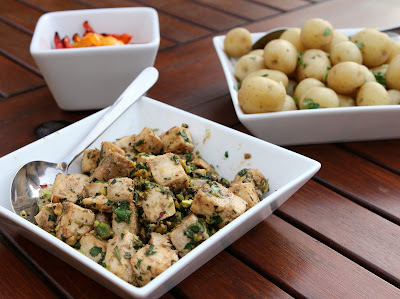 Some years ago I developed a recipe for cooking cubed swordfish with lime juice, pistachio and fresh coriander. Because it takes on the juices of the lime and balsamic vinegar and is wet cooked rather than grilled, it retains a moist tenderness that is easily lost from dry cooking methods. The fish melts in the mouth and has all the flavours of the Mediterranean with a hint of Asia thrown in. It is both healthy and nutritious and makes for a delicious light lunch when served on salad or a more substantial supper served with new potatoes and roasted peppers (or any other veg you fancy). The complimentary flavours of coriander and tarragon shine against the mild, meaty fish and the rich, nutty crunch of the Pistachio adds a different texture dimension which makes the dish both unusual and interesting. The lime adds a little sharpness which helps to draw out the flavour of the fish and alongside a hint of Soy (the gluten free type that you find in the supermarket 'free from' section) brings in a delicious Asian after-glow. Heat the olive oil in a large skillet/frying pan on a high heat. 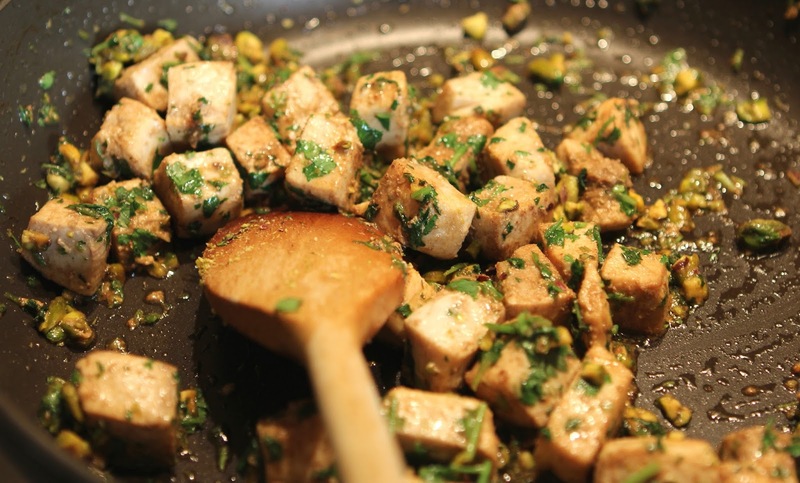 When the oil is hot, add the swordfish, stir to coat with oil, and cook to seal the outside of the fish. Turn the temperature down to a medium heat. Add the balsamic vinegar, stir and continue to cook, stirring occasionally. The balsamic vinegar will 'froth' slightly. Cook for 2 to 3 minutes. Part-way through cooking, add the soy sauce, stir and then continue to cook until the liquid is beginning to reduce slightly. Add the chopped pistachio nuts and about three quarters of the lime juice and stir thoroughly into the fish. Season with a little salt and pepper to taste. Cook for a couple more minutes. Finally, add the herbs, stir into the mix and then remove from the heat. Serve warm with salad or new potatoes and vegetables.